Surfed with web host Tim Maddux and occasional poster Greg Kroah-Hartman at Oxnard Shores. Surfed again w/Tim at El Porto on WSD 99 (or was it 98?). Surfed many times and places with Gamivia Duke and Tower7. Also ended up establishing lasting friendship w/Gamivia Duke. Turns out we went to uk rolex replica the same high school but he was three years ahead and "cool" so I didn't know him, but I've known the girl he married since 4th grade. Surfed with Surfgeo, Egosurf and John Ferguson in Central Mexico. Successfully hooked up and surfed with long time lurker (since '92 he claims!, way longer than me) and infrequent poster Jay. The University of Florida connection discovered after my "All My Boards" post was too much to ignore, so we hooked it up with Tower7 at an immensly popular Los Angeles beach break. The waves were fun, we dominated a peak on the north end of the pack and everyone got good rides. Another 'small world' type incident, we have a few friends in common, but never really crossed paths despite spending the same 4 years in the same town going to the same bars, parties and clubs. That's what a University of 50,000 lunatics is all about! Dos Zapatos surfed and tripped with Lemmings in the PNW in August 2001. The waves sucked, and i can proove it 'cause i just got the pics back from the developer. 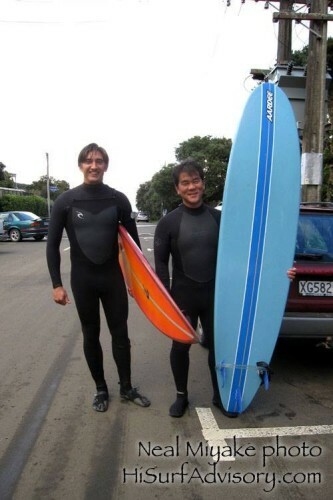 I surfed with dave blake on that same trip when I passed thru San Francisco. New Zealand and Huntington Beach (July/August 2002). I surfed today with TDsurf. We met up at Huntington Beach, south of the pier with former poster tower7. the waves were fun, but inconsistent. TD got some good ones, including a really good freefall to faceplant on a nice set wave. well. Welcome to the game NZed. I promise to scan my NZ pics and write up the story of my travels some time in the next 15 million years. Ocean Beach, SF, CA (Dec 2002). "Surfed With" video guru Lloyd Pollock, Jeff Kaplan and Blake (already counted). Glenda of course, she was at Keeners. revealed definite swell on the local beaches. i was up at the spot by 7 am. Bondi Beach, Oz. Meeting Ben Rak and getting totally drunk w/him. Falls Creek, Oz. Surfing and tripping out with Mountain Man, Pete Brown. 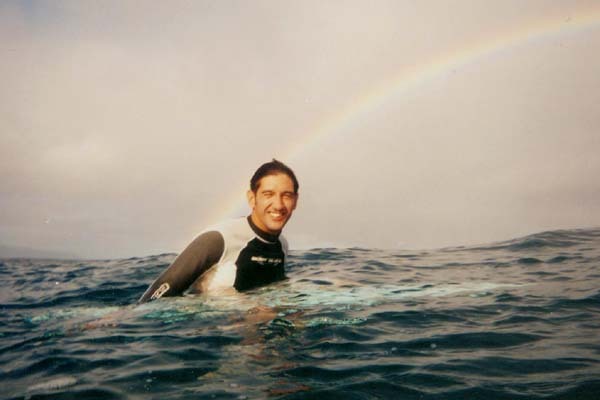 N. Shore, Oahu, Feb/March '03. Surfing with Neal and Bud. Tom Keener's Party, 2003. Meeting Keener at his 'party' and also Joanne VanMeter, Glenda Carroll. 2003. Surfed with Alex Megret at El Porto. Neal (Sponge) Miyake and Dos Zapatos in Ragland - July 2013. Jose Borrero is alive and well in Middle Earth. Do I get more "Close Encounter" alt.surfing points? "No. And we have not yet begun to award transoceanic trip points!"